At long last, The Magus will have it's Winnipeg premiere at Gimme Some Truth in Manitoba, Canada, which runs October 13-16, 2011. The Magus will screen alongside the feature film The Upsetter: The Life and Music of Lee Scratch Perry (Ethan Higbee and Adam Bhala-Lough ) on Saturday, October 15th at 7:00pm at Cinematheque (100 Arthur Street). Gimme Some Truth is a unique, four day documentary forum that includes panel discussions, master lectures, workshops and special screenings – all intended to provide filmmakers and audiences alike the opportunity to discuss creative, ethical and technical issues related to the documentary form. 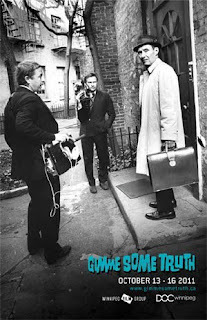 Gimme Some Truth is produced by the Winnipeg Film Group, in partnership with DOC Winnipeg.